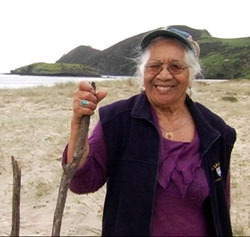 Merimeri Penfold has been a pioneer all her life - as a champion of the Māori language - as a woman leader in the North and at national level - as a composer of haka and waiata - and as a generous, creative influence in many areas of the arts. Merimeri is a lively and inspiring figure who has been involved in many big changes. Her long and eventful life story provides a rich perspective not only on the far North but on many important events and people in the recent history of our country. In the course of the documentary she presents her "dreams" for the future of Māori language and culture. 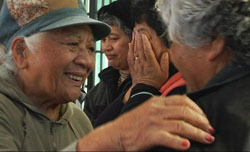 He Wawata Whaea was commissioned by Maori Television and made with funding from Te Māngai Pāho. It screened on Māori Television at 8.30 pm on Wednesday July 1st. 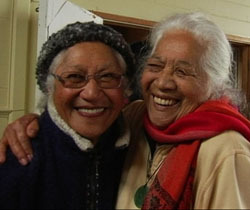 He Wawata Whaea screened at the Hokianga Film Festival at Moria Marae, Whirinaki, on Sunday May 31st. Whaea Merimeri Penfold and director Shirley Horrocks were on hand to introduce the film.